There are a multitude of dogmas that lurk like spectres over the process’s of looking at and doing art. Like a catalogue full of off the shelf strategies they function at times like an idiots guide to any given area of practice. These culturally agreed terms of reference then define and at times limit the rules of the particular game in question. Then you come across an artist like Rina Banerjee, the rule book rattles, the cultural frames get mixed up, and it gets interesting. One could start by describing the qualities of the work itself. It is highly theatrical, it is eclectic, it is decorative, it is busy and borders on (but is emphatically not) kitsch. It is not ironic. It is for the large part a curious mix of almost shamanistic encoded inter cultural signification. Were it more sober it would be redolent of Bourgoise, but it is brighter, busier and less melancholy in its mood. However, do not mistake this relative lack of sobriety for frivolity, this is serious work. The works intercultural references stem naturally from the artist herself, but they are not laboured in any sense. The high levels of colour and sparkling ornamentation are ordinary when seen in the context of female attire in the Indian sub-continent or around many UK cities for that matter. But built into these eccentric sculptural forms and shown in the reified space of Haunch of Venison, a veritable temple to the western contemporary art market, they are far from common place and step into the extraoridinary. The material are both found and fabricated into complex sculptural forms. In one work a Victorian wooden chair frame hangs close to the top of a tall ceiling. Attached to the chair is what looks like wooden tribal mask and a pronged shape protruding from its side. A broken, oriental umbrella spikes out of it top vertically. A series of flower form pink lights surround the chair, below which, a long twisted tube of white netting connected by vertebrae like fixings. drops close to the floor. White feathered bird wings splay outwards from the bottom of the net and large clear light bulbs dangle close to the ground just above a small mound of sand on which three small orang-utan like forms are sitting as if zoo specimens or three wise monkeys. These at times disparate elements manage to work dynamically together on a formal level whilst sparking questions relating to a sense of cultural disconnection. The experience is on of initial exuberance, followed by a lingering sense of poignancy. 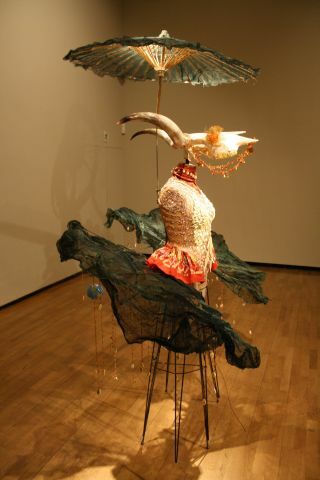 Other works feature shells, African necklaces, plastic animal bones, corset forms, cow horns, brass bells, ostrich eggs and so on. All these works are dramatically lit. For many of us to produce this work, it could come across as rather left field, but given Banerjee’s Indian origins, and studio base in New York, it all starts to makes some kind of sense. The clue is all in the title of the show ‘Forever Foreign’ and it is this genuinely fuelled cultural interplay that fuels this genuinely interesting work.